I think when people say don’t feed the trolls they might not think about what those words mean. It’s not like not responding will starve them. Saying don’t poke the bear might make more sense, except the troll is awake and already doing damage. Pretend to be dead, show your throat, maybe that’s what the ancient instinct comes down to, don’t find trouble. But the trouble is already here, trouble gains momentum, trouble gains entitlement when its used to bared throats. Maybe when saying “don’t feed the trolls” think about who exactly you’re asking to be submissive, play dead and show their throat. 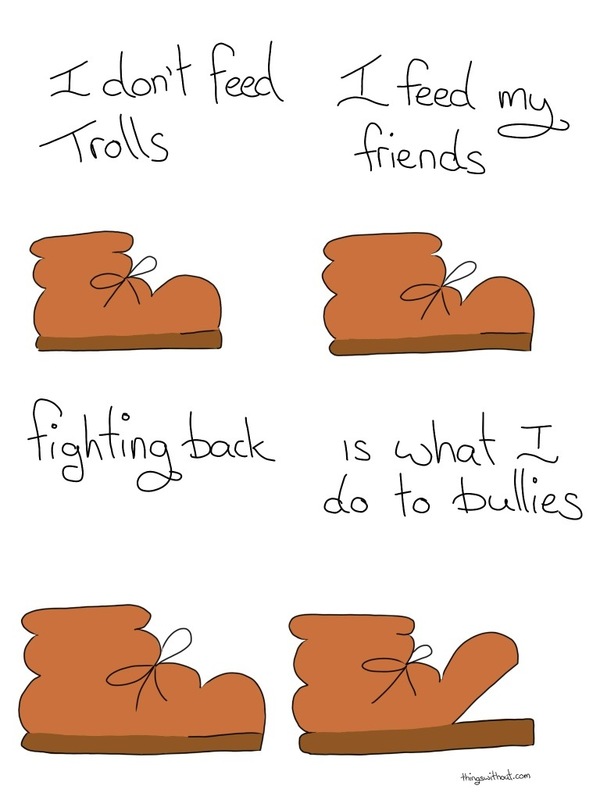 Maybe it comes down to defining a troll as a very specific subset of bully. A troll isn’t someone making a mistake who will listen to reason or fear retaliation. A troll is explicitly seeking conflict, and any response at all — including categorically demonstrating their innefectual wrongness — is precisely what they seek. They derive amusement from the very fact that you disagree/are angry. And the more invested you are in your response, the more ways they can find to trivialize, gaslight, mock, or even blatantly ignore what you say. Sometimes simply ignoring them and refusing to engage is the most effective way to rob them of destructive power, as it starves them of ammunition. Sometimes fighting trolls means starving them of oxygen. Too often your response means letting them dominate and take over spaces. Ignoring is not an answer. Sometimes starving them of rewards is. Sometimes them experiencing consequences is.